Beards making all kinds of history, and having an incredible season!!! So happy House is back, 6/11 from the 3!!! Keep it up big fella!! 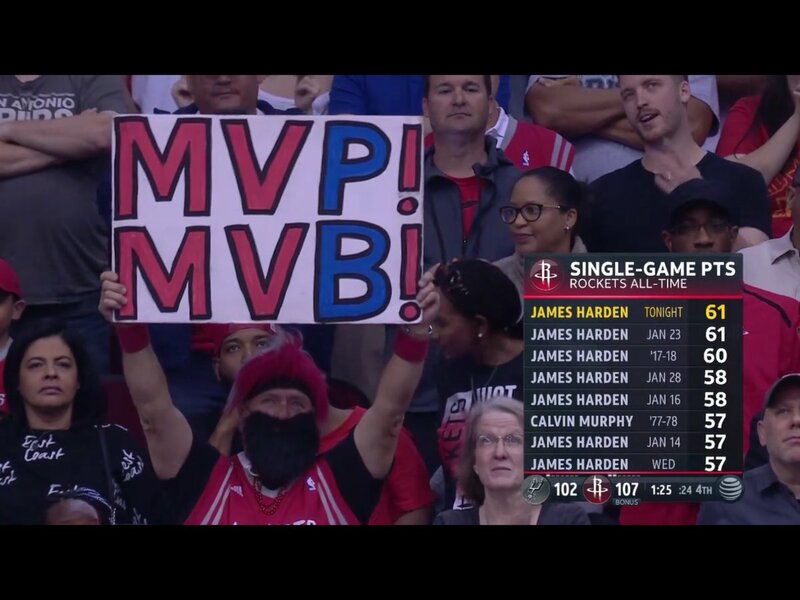 Humbled, hardens beard, HOU$TON and 2 others like this. I'm barely finishing watching the Hawks game, but I was pretty disgusted watching the Memphis game. Green was really the spark for them to start gaining momentum, and Harden was laying everything out there for them to win, only to come out with a ****ty ending and result like that. While MDA is spotting Rivers, Faried, and Gordon rest, HARDEN should be getting rest, but a lot of these games down the stretch seem to be important, but whatever. Capela has been getting killed by bigger centers since the Allstar break. puglife and HOU$TON like this. pums, puglife, HOU$TON and 2 others like this. pums, HOU$TON, barrebaby and 2 others like this. Humbled, wballz, HOU$TON and 1 other person like this. so we basically just need to make sure we hold onto the 3 seed and not fall any further. then we also have to hope the warriors end up with the 1 seed so we wouldn't see them until the wcf right? CP3 "stole" like 6 points from JH after he TIED his career high. Let that man take at least 2 of the 6 FTs, wtf. HOU$TON, hardens beard and Peep Game like this. Running the game back, and my goodness, this is the second game where Capela looked absolutely embarrassing. He was getting outworked by Betrans and Poetl(sp?). LMA looked like trash offensively, but still managed to block Capela multiple times. Harden truly did not want to lose that game after that garbage in Memphis, and it's been a feat to see. It's like 6:00 left in the 4th and the Spurs are up by 5, and Harden wasn't about to let another game get away again. pums, second2nonee, barrebaby and 2 others like this. hardens beard, Peep Game and barrebaby like this. Im beginning to feel like it’s better to face the warriors earlier in the semis rather than the WCF. Cause CP3 will be fresher. well the nuggets and warriors both got blown out this weekend. if only we hadn't dropped that game against the grizz, we'd only be 2 games back right now. Peep Game and barrebaby like this. Humbled, puglife, Peep Game and 2 others like this. Peep Game, pums, HOU$TON and 1 other person like this. HOU$TON and Humbled like this.